Data analytics and AI is now on the agenda of every organisation. After years of being the back-room preserve of analysts, it is now out in the open, in the boardroom and being proclaimed as central to business strategy and transformation. If this were not enough, the data analytics processes actually running in the organisation are no longer just reports or ad hoc queries by individual users but are now integrated with on-line transactional systems and enable business-critical activities. Analytics has made the transition from end-user computing to an enterprise capability requiring support and governance by IT. The journey has not always been easy with analysts and IT often experiencing a culture clash. All this has come to the attention of the people responsible for planning IT capabilities: the Enterprise Architects. Analytical systems now need a defined place in the Enterprise Architecture alongside transactional systems, CRM systems, data warehouses, communication systems and other core systems. They need to be described in architecture views and blueprints. Increasingly, Enterprise Architects are looking for a clear conceptual framework for analytical capabilities or services, and to implement those capabilities in a consistent and integrated set of software known as the Analytical Platform. What is the Analytics Platform? It is a generic definition not tied to any one vendor or technology. That makes it entirely suitable to be adopted by the Enterprise Architects in any organisation. It can be run on any computing platform, on premises or in cloud. It could even be distributed with elements running in databases or in edge devices. It supports analytical activities related to data, discovery and deployment. These three categories will be important in building the conceptual framework. 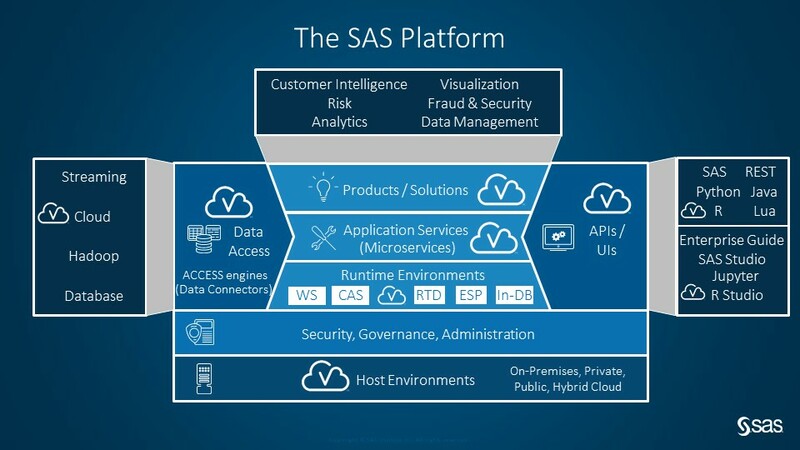 This view is useful for understanding how SAS works as an integrated platform with its interfaces to data (left of diagram), user interfaces (right), infrastructure (bottom) and business applications (top). Enterprise Architects will usually want to take a step back from this and consider a highly idealised view of the organisation’s required analytical capabilities without any assumptions about implementation details. TOGAF calls this an Architecture Vision or "conceptual-level architecture”. The Enterprise Architect’s role is to create the Architecture Vision and show how it supports the business scenarios. While the description will be conceptual, it also has to be realistic. One way of doing this is to abstract from a known technology framework (e.g. the SAS Platform) to create a conceptual description based on services. This view will be vendor-neutral but we can have the confidence that each element is viable. We can think of the platform as providing services related to each phase of the analytics lifecycle: data, discovery and deployment. The diagram below shows these in three layers. Data is the foundation for analytics. Data services include data capture from various sources including files, databases, Hadoop, message queues or the web. Data quality will need to be addressed and the data transformed into an Analytical Base Table or other structure. Wherever possible this should be formally managed with full data lineage but there will always be the need for an analyst to perform further ad hoc data preparation. Discovery & Modelling is the main collection of services we associate with analytics. It includes visual reporting interfaces and the whole range of analytical algorithms. Deployment & Execution is all about services to deploy analytics into applications and processes. Rules and models may be selected through Discovery & Modelling activities but additional services are needed to control changes, deploy to an execution environment and monitor performance (e.g. champion vs challenger). Analytical execution services enable models and rules to be run against a data stream (SAS Event Stream Processing), within a database (SAS Scoring Accelerator) or as a web service (SAS Micro Analytics Service or SAS Real Time Decision Manager). There are also case management and workflow services, which support user activity in analytic applications. Analysts and data scientists will use the Analytics Platform services directly, possibly through a coding interface, but for most business users this is not appropriate. They need to utilise analytics within an application which supports use cases for their role (marketer, fraud investigator, credit risk analyst etc.). Analytic applications sit on top of the analytics platform, utilising the services and surfacing the results to the user in a friendly interface. SAS offers a range of applications or solutions, targeted on a particular domain or industry. Applications can also be built using common development packages, such as Java or Python, utilising the Analytic Platform services through APIs. 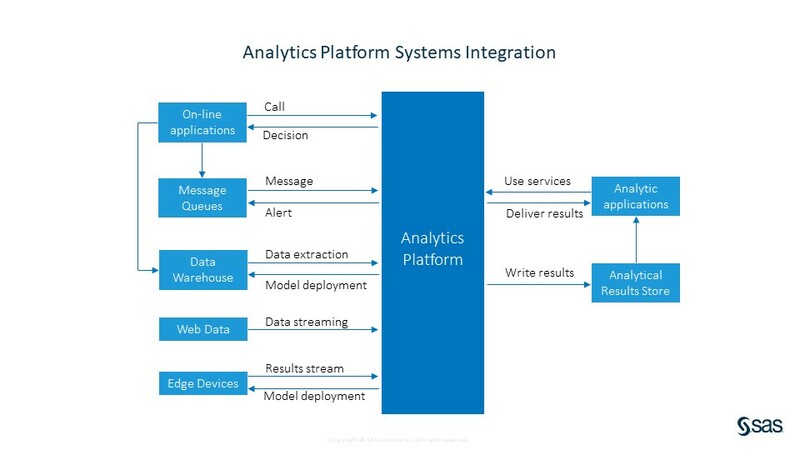 The Analytics Platform is shown collapsed in this diagram as the focus is on the Analytic Applications. These applications can, of course, be mapped to business scenarios, user roles and Analytics Platform Services. You just need a different version of the matrix. Increasingly, we see Analytics and artificial intelligence embedded within systems and core business processes. Human operators are either guided by the results of analysis (e.g. recommendations for next best offer) or decisions are being made automatically by algorithms. Analytics must therefore reach beyond the data scientists and the domain specialists into the systems supporting key transaction cycles. The diagram below shows how this could work. You could argue it is more logical rather than conceptual, as it refers to certain technology patterns, but it is still a high level view. On-line applications, the core business systems, can call the analytics platform for real-time recommendations or decisions that directly impact customer interactions. Near real-time interventions can be made by listening on message queues to detect unusual patterns of activity and responding with an alert than another system can act upon. If overnight processing is acceptable, the data can be sourced from a data warehouse or models can be run directly in the warehouse against data in situ. Web data is increasingly relevant to assess trends and this can be streamed into the platform for text and sentiment analysis. As the IoT expands, edge devices will be running analytical models that enhance the data (e.g. classifying images) and provide a focused stream of analytical results back to the platform. Some business analytic applications will be built on the platform and utilise its services directly but other, remote or downstream applications, may need output data written to an intermediate analytical results store (e.g. HDFS). 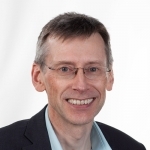 By this point it may be clear that SAS Platform provides the capabilities needed for the organisation and is the best choice for the future target architecture. 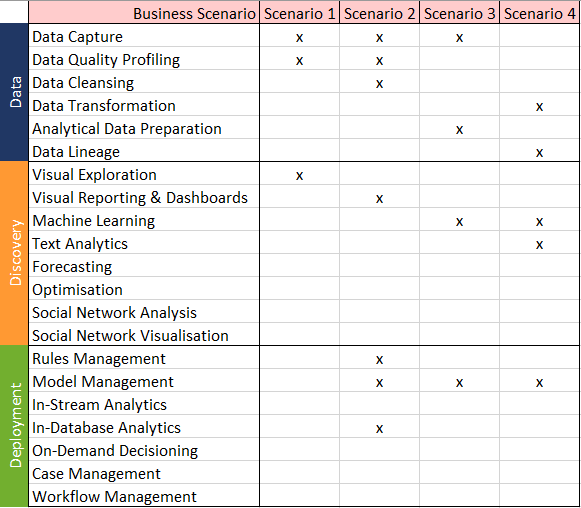 The exploration of the business scenarios and Architecture Vision will have identified the analytical services needed and the way they need to interact with other elements of the software landscape. The next level of architecture work can examine exactly which elements of the SAS Platform need to be deployed and how they should interface with other systems. 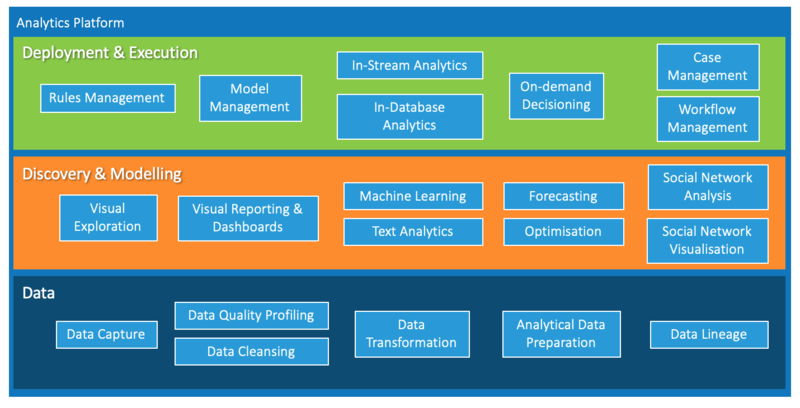 SAS can help you explore business scenarios for analytics and related Analytical Platform Capabilities through a Business Analytics Modernization Assessment exercise. This is a series of facilitated workshops providing recommendations on business analytics in the context of current and future business requirements, timeframes and critical success factors. SAS specialists can also assist with developing architectures for analytics. For further details contact your account representative.